This fibre tip Pentel Sign Pen features non-permanent, water based ink and writes a 2.0mm line width. Perfect for graphics and illustrations, the environmentally friendly pen is made from 83% recycled materials (excluding the ink). 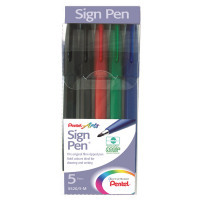 This assorted pack of 5 contains 2 x black and 1 x blue, red and green pens.